A pillow is a person’s best friend. It helps us achieve a good sleep position and get the rest we deserve. However, there are different types of pillows on the market today. And there are different sleeping positions that can help us deal with different health issues. But in order to get the best results, we recommend you buy a positioning pillow. If you wonder what type of pillow is this and why do you need it, know that this type of pillow will help you improve your posture, reduce back pain, neck pain, arm or ankle pain. High-quality pillows for elderly are hard to find. However, we have made research and compared the best pillows on Amazon in order to help you choose the best fit for you. What is the function of positioning pillows and why do I need one? The name of these pillows says it all. They help you improve posture, meaning, they will help you keep your body in the right position while sleeping, reading, or simply relaxing. Also, this type of pillows can improve your sleep and make you feel comfortable during the night or day. Most pillows of this kind are made of polyester or polyurethane foam. They usually come in a white cotton shell. However, we will talk about the features of these types of pillows after we explain all the great benefits they have for the elderly. 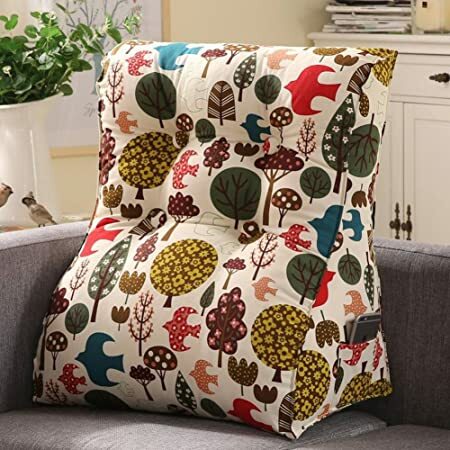 Not surprisingly, people in senior years are the ones who need these pillows the most because most of them do not move enough during the day as when they were younger. This may increase the risk of pressure ulcers. However, if they change their sleeping position continuously, the risk might reduce and their level of comfort might increase. Different types of pillows offer different benefits for the elderly. There are pillows you can place beneath your legs, between your knees, under your arms, neck, and knees. This pillow is often placed a long way to keep your body in a comfortable position and reduce the neck pain. 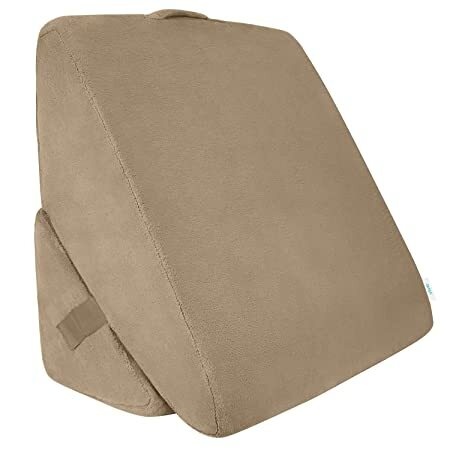 No matter if you are dealing with respiratory issues, back pain, neck pain or shoulder pain, positioning this type of pillow down under your shoulder neck and head, you will feel a lot more comfortable. And the pain you feel will start reducing. If you prefer sleeping on your tummy, placing body pillow or many pillows to hug in your sleep is recommended. Just place the pillow next to you and get on top of it. However, place only half of your body on it, while placing your top arm and leg up over the pillow. There is a pillow you can place between your knees and under your knees. If you sleep on your side, it is recommended that you place this type of pillow between your knees. It will prevent you from developing pain in your hips and knees. Also, it makes a perfect position if you had a knee/hip surgery. If you need to sleep on one side only, you should place a pillow behind you. It will stop you from rolling over and keep you in one position. However, if you deal with back pain, you need to find the best position that will help you reduce the pain. You can try to sleep on your stomach. Or on your back with legs raised. If you choose the second way, on your back with legs raised, it is recommended to place this type of pillow under your knees. It will offload the spine and reduce the back pain. This is also a great position for people who had surgery and have to sleep on their back. If you recently had surgery, sleeping in your bed can be a challenge, especially if you do not have the right pillow. Most patients, after surgery, are told to sleep on their back. And if you are one of them, in order to feel comfortable in this position, you can place a pillow behind your arm or under the arm to support your shoulders and reduce the pain. As you can see, being creative with pillows might help you reduce pain in different parts of your body. However, before you buy a pillow, you should consult your therapist for a suggestion on sleeping positions. After, pick the right pillow from our table down below. After doing our research on best pillows on Amazon that help elderly reduce pain while sleeping and improve posture, we found these among the top-rated pillows. Take a look. 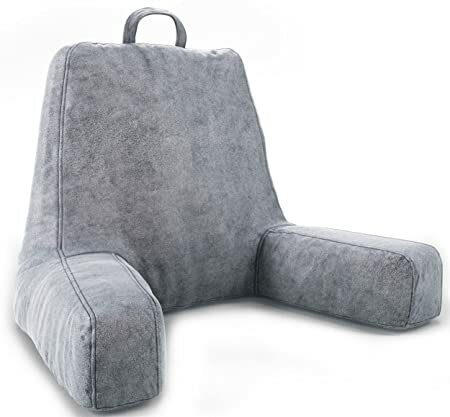 If you want to turn your bed into a cozy, comfy recliner, this wedge pillow is perfect for you. It is ideal for sleeping, reading, acid reflux or post surgery because it is made to improve your posture and support your head, neck and shoulders to reduce the pain. With this pillow, you will definitely solve the snoring or breathing issues you have at the moment. This nice bed wedge pillow will help you improve your sleep and overall health. Both adjustable and multifunctional, this pillow is also known as an anti-snore pillow. It will keep your body in the ideal angle degree and solve your snoring and breathing issue. The memory foam maximizes your comfort and fits your body’s shape ideally in order to provide restful experience. It is not too soft. And it is not too firm. It is just perfect. The Cushy form wedge is 26 x 25 x 7.5 inches and some use it for leg elevation as well. However, it is suggested that you place an extra pillow on top of it for better support. Do not worry about maintaining the pillow because it comes with a breathable, washable cover. Designed to maintain ideal temperature, the cover is easy to remove and wash. It weighs only 5.4 pounds and will become your new best friend. Feel free to use it for sleeping, reading, making love, acid reflux, post surgery, leg elevation or just relaxing. It is easy to maintain because it comes with a washable and breathable cover. It is not too soft and not too hard but medium soft. It is perfect for people who sleep on their back and have back pain or deal with snoring and breathing issues. It arrives highly compressed in a small box. You have to give it time to take the original shape. It has a temporary chemical smell because of the memory foam. Comfortable, washable, medium soft (perfect support), hypoallergenic, antibacterial. It is multifunctional, so you can use it for different purposes. The best anti-snoring pillow. Made of 100% velvet, the Queen Rose pillow has a unique design. The pillow is U shaped and ergonomic. Meaning, it follows the natural shape of the body for pregnant women. You might wonder why do we suggest it for the elderly if it is designed for pregnant women. We discovered that it is also good for arthritis. It reduces the pain and offers comfortable sleep. You can use it for watching TV, reading, sleeping and reducing pain. It is multifunctional and provides great support to your entire body. Makes the perfect Christmas gift or birthday gift for your pregnant sister, wife, girlfriend, mom and best friend. But if you have parents who suffer from arthritis, it makes an ideal parent gift. Don’t worry about maintenance because the pillow is machine washable and arrives with a washable pillow cover. It is easy to remove and easy to clean. Made of polyester, this pillow is the best choice for pregnant women or older people who suffer from arthritis. It is 55 x 31 x 7.8 inches and weighs only 7.09 pounds. Definitely a must-have pillow. It is a full body pillow that reduces every type of pain and improves posture. Also, it arrives with a washable pillow cover. So, it is very easy to maintain. The best pillow for elderly who suffer from arthritis and pregnant women. According to some reviews, we found online, it is not as soft as described. But let’s not forget that everyone has a different taste and certain expectation. If your height is lower than the average height, it is possible that your belly will not fit the gaps in the pillow and provide you with the full support. But if you look for a pillow that will reduce your pain and help you with arthritis, this is it. Multifunctional, ergonomic pillow that follows the natural shape of your body. It does not smell. Designed to provide you with body support, reduce pain and improve posture. If you search for the best bed wedge pillow you can use for different purposes, Xtra comfort bed wedge pillow is a perfect choice. Versatile 3 in 1 design that will allow you to put it under your head or the back of your legs. It is compact. You can travel with it. It is suitable for any bed and will provide additional support and comfort to your back, neck or legs. It is up to you how you will use this simple but functional and comfy pillow. Made of supportive breathable memory foam, this pillow is neither too soft or too hard. It is medium soft and provides optimal support. You can use it with your regular pillows. Do not worry about maintenance because the pillow arrives with a washable, zippered cover that is easy to remove. It is made of soft, breathable polyester in neutral beige. It can be used for sleeping, reading, improving posture, reducing pain, providing a more comfortable sleep, or you can buy it as a present for someone’s birthday or Christmas. Xtra is 26 x 10 x 10 inches and weighs only 4.7 pounds. It elevates the head perfectly. A versatile design that allows you to use it for different purposes. It elevates the head with the right amount of pressure, to prevent stiffness in your neck. Easy to maintain. Breathable and comfy cover. Made of supportive memory foam. The pillow cover comes in neutral beige. However, considering all the health benefits you get with this pillow, the color should not be much of a problem. It may have a weird odor during the first night. Air it outside before using. Comfortable. Multifunctional thanks to the 3 in 1 design that allows you to use it for sleeping, reading, reducing neck pain, shoulder pain, back pain or improve your posture. 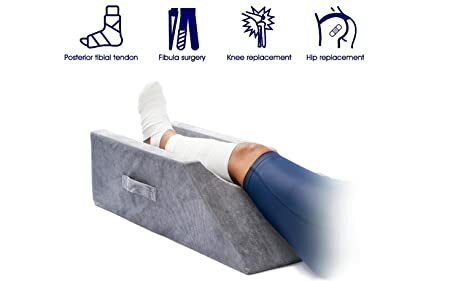 Made of memory foam layer on top, InteVision Ortho wedge pillow will provide the best support for your legs, thanks to the firm base. 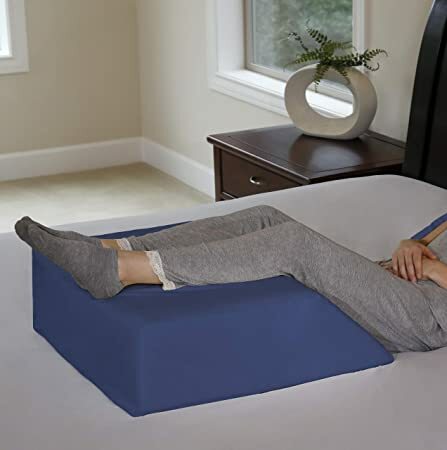 It is very comfortable and will help you reduce pain in the legs and you improve sleep. It has a bit salty price but it is worth it. It is not too soft. However, it is not too hard either. It is perfect and provides the full support you need after leg surgery. You can also use it to rest your legs while reading or relaxing after a long day at work. Most people buy it because it improves circulation. 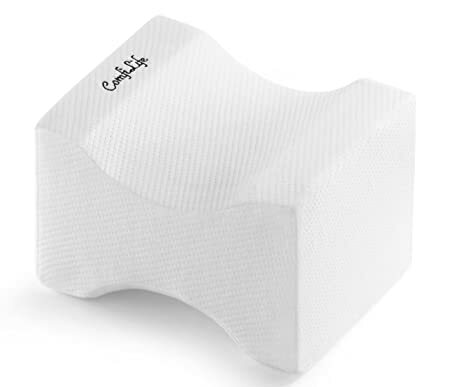 InteVision Ortho wedge pillow is 8 x 21 x 24 inches and weighs 3.45 pounds. It does a good job at relieving back pain, improving circulation or allowing the spinal cord to relax. And the best part of it is that the cover is 100% Egyptian cotton and it is easy to wash.
Firm base but also comfortable. Made of memory foam. It will support your legs but also improve your posture, circulation, and allow your spinal cord to relax. It is definitely worth the price. Perfect for reading, relaxing or post leg surgery. Some complaint about the cover. They say it is oversized for the pillow. It appears to be firm for some people, but every person’s taste is different. High-quality product. Firm but comfortable. Pricey but worth it. Made of memory foam. Ideal for sleeping and relaxing. It improves the function of your spine and circulation. Made of medical grade memory foam, the cozy nut soft pillow is the best one on the market for reducing lower back pain and improving posture. It never loses shape thanks to the medical grade memory foam. Offers the proper balance of comfort and support. It is hypoallergenic, dust mite-resistant and anti-bacterial pillow that is loved by many. Do not worry about maintenance because it arrives with a super soft velour cover. It will make you feel like sleeping on a cloud. The cover is breathable, washable with moisture-wicking properties and absorption ability. It has the perfect dimensions, 9.9 x 5.9 x 4.8 inches and weighs only 1.1 pounds. It will fit different sleeping positions while providing the best support. Unlike other pillows, it will let you sleep in your favorite position. But this time, you will sleep a lot better. Cozy Nut Soft memory foam pillow is specially designed to reduce the pain in your lower back, prevent a strain of lumbar muscles, reduce pressure while sleeping, provide and best support or relieve lumbar pressure. It is best for pregnant women or older people. The versatile design will not only protect your waist but also prove comfort. Feel free to use it below the knee or between your legs. 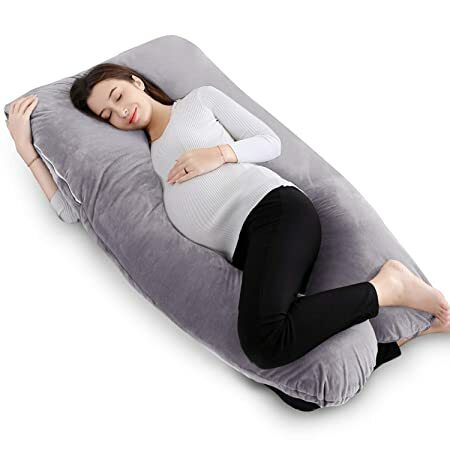 No matter if you are a side sleeper, back sleeper or tummy sleeper, you will absolutely love this magical pillow with memory foam. Made of medical grade memory foam that provides the best support and fits any sleeping position. Comfortable. Multifunctional. Thanks to the memory foam, it will relieve lumbar pressure, prevent a strain of lumbar muscles and reduce pain. It is not too high. Or too low but perfectly designed to fit any sleeping position. Some customers have found this pillow too low. However, if you prefer sleeping on your stomach, it is perfect. It is also great for back and side sleepers thanks to the medical grade memory foam that allows the pillow to provide the comfort you need. However, if you find it low, you can combine it with your regular pillow. High-quality medical grade memory foam pillow. A comfortable, multifunctional and orthopedic pillow that will prove the best support and become your new best friend. The name of the pillow says it all. It is one of the best body pillows on the market. High-quality pillow with cut foam which provides better airflow. Flexible and comfy. It does not matter what relaxing position is your favorite because the Zaraki pillow fits just any relaxing position and will provide comfort and body support to every individual. Maintaining this pillow will not be a problem for you because it arrives in soft plush grey velour cover. Do not worry because it is a comfortable, cozy cover that is easy to clean. If you deal with head pain, arm pain or back pain, this is the pillow for you. It provides the greatest support to your head, arms and back while watching TV, reading, relaxing or napping. You can use it on your favorite chair and bed. Or you can put it on the floor. Zaraki pillow is a compact pillow. Meaning, you can wear it with you wherever you go and enjoy your travel with your new best friend. When you find it dirty, take a damp cloth, detergent and clean it. Zaraki pillow is 21 x 8.5 x 8 inches and weighs only 5.65 pounds. Compact and made of shredded foam. It provides full support to your head, neck, and back. One of the best comfortable pillows for relaxing on Amazon. Some find the non-removable cover of this pillow as a disadvantage because they cannot wash it in the machine. But it is very easy to clean with a damp cloth and a detergent. Also, it arrives compressed. Meaning, it needs some time to get in the original form. Some customers find the waiting unexpected and frustrating. Good quality for the price. Perfect for reading, napping and relaxing. Comfortable and made of shredded foam. You can take it wherever you go and use it wherever you want. 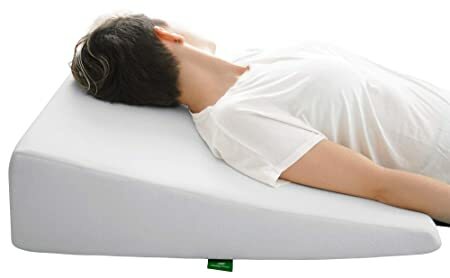 Clinically proven to help reduce back pain, the angle memory foam wedge pillow is the best choice for the elderly who suffer from lower back pain and other health issues. However, it will not only reduce the pain in your lower back and provide comfort but also help you with muscle spasms, tension, stress, fatigues, arthritis, edema, sciatica, phlebitis, bulging disc, and strain. It is the ideal therapy pillow for improving the sleep. Thanks to the perfect design, it provides support to the spine and reduces pressure on discs and muscles. According to many positive reviews, it proves that it helped millions. It is 27 x 20 x 10 inches and weighs only 3.5 pounds. The pillow has a 5-year warranty. You will get a pillow that will support both your knees and legs at once. Meaning, it is a 2 in 1 pillow. An American product that will definitely meet your expectations and needs. Eco-friendly. Clinically tested. Comes with a 5-year warranty and you can choose from 4 different sizes. Washable and easy to maintain. Hypoallergenic. Comfy. It might have a strong chemical smell the first time you use it. Also, some find it too high. But it depends on your choice of size. Make sure you pick the right one. A nice pillow for the price. Easy to wash. Hypoallergenic, eco-friendly and comfortable. However, give it time to lose the chemical odor. Considering all the benefits, the smell does not seem like a problem. Clinically tested. It is proven that it helps with back pain. If you have an injured leg or had an ACL surgery, femur or hip replacement, this light ease memory foam pillow is the right choice for you. It will provide the best elevation support to your leg and knee joint. It improves circulation which helps in healing and reduces pain. It is perfect for legs, knee or ankle. It helps reduce the swelling and speed up the recovery process for 30%. Made of quality memory foam, it will make your leg, knee or ankle feel well protected. It is 31 x 13 x 9.5 inches and weighs only 2.8 pounds. You do not have to worry about hurting your leg, knee or ankle while sleeping. This pillow will keep it protected for you. It improves circulation. Speeds up the healing process for 30% and makes you feel protected. Made of memory foam. Reduces swelling. Easy to carry around. It arrives vacuum packed. Meaning, it will take some time until it expands in the real original shape. Also, it might have a strong chemical smell after unpacking. It provides the best elevation support to your leg and knee. It will help you heal faster and reduce the swelling while providing protection. It has a comfy, soft and short plush. Designed for sciatica, back, and hip pain relief while sleeping, the ComfiLife Orthopedic pillow is the best solution for your problems. It provides the best support that will help relieve pressure on the lower back and reduce sciatica pain. Made of long-lasting, high-quality cut memory foam, it will not lose the original shape after some time. The ergonomic design will keep your leg, hip, and spine in the perfect alignment at night and improve your circulation. It is 9.8 x 7.9 x 6.3 inches and weighs only 8 ounces. Do not worry about maintenance because it arrives in a nice, removable cover that does not allow the pillow to get warm. Made of high-quality, long-lasting material. Weights 8 ounces, meaning it is very easy to move around your home. Perfect alignment for the leg, hip, and spine. Improves circulation. Will not lose the original shape after time. A must-have. Some customers find it too soft, while others claim it is too firm. However, it all depends on the person’s taste or perception. Also, it may have a strong chemical smell the first day. The zipper is fragile, so you need to be extra careful with it. Orthopedic pillow made of durable quality shredded memory foam. Definitely a great product for the price. Easy mobility and provides the best alignment to your leg, hip or spine. It will also improve your circulation and keep the original shape for a long time. If you were searching for the perfect pillow for reading in bed and improving posture, this is it. Made of cotton, Wowmax wedge pillow will meet your expectations and needs. It provides an excellent neck/back support. You will feel comfortable while reading in bed. However, you can also use it for napping, watching TV or just relaxing. Decorative. Functional. Ideal for college students who prefer to study in their beds. Easy to wash. It comes in two different sizes such as 22 and 23 inches and weighs only 5.51 pounds. Amazing back and neck support. Comfy. Perfect for reading, napping or relaxing. Ideal for those who want to add some color and comfort to their life and sleep. The only disadvantage of this pillow is that you cannot sleep on it. Easy to wash and maintain. Definitely a must-have product. Amazing quality at a great price. Perfect for resting, reading and watching TV. Colorful. Fun and easy to move around. A nice product that will improve your posture and make a great decoration to your home. The Only Buyer’s Guide you need: How to pick your positioning pillow? If you don’t know what type of pillow you need and how to pick the best one, we have you covered in this guide. Read on to learn more about how to pick the best product. Ultra slim or slim pillow? If you prefer to sleep on your belly, it is recommended that you buy an ultra slim or slim pillow. It will help you breath more easily and help reduce your back or neck pain. Buying a fluffy pillow is not recommended because it can interrupt your breathing. A flat, low-quality pillow won’t do you any good either because it won’t support your neck. The best option is to pick a pillow that is not very thin but thick enough to support both your head and neck. Consider buying the one that is thin on the top part for the head. And if you sleep on your back, don’t buy a pillow that is too high or too low but medium. If you buy a medium-soft pillow, it will curve with the neck just perfectly. Avoid pillows that are too hard because they won’t let the neck curve naturally, while too soft pillows won’t provide any support to your neck/back. Look for an elastic and thin sleeping pillow. What type of material should I look for? Memory foam and shredded memory foam will help with your head and neck pain. Gel or water-filled pillows are cool and will provide you with the best sleep ever. Down pillows aren’t recommended by experts because they lose their shape with time and contain allergens. It is best to pick a memory foam or gel-filled pillow. These are the 6 features you should look for in sleeping pillows to pick the best one. If you live in a hot or humid region, buying a pillow that is not waterproof and gets wet easily, is not a good idea. You should always buy a waterproof pillow or slipcover for it. You should buy a pillow mace with cooling technology like the ones filled with gel/water in order to reduce the moisture and heat. The cooler your pillow, the better your sleep. Never pick a pillow that is too hard or easy to scratch because you will not enjoy a nice sleep. A comfortable pillow that is medium-soft will provide both, comfort and support. We did not have to mention this feature because you know how important it is for your pillow to be washable and easy to clean. Chose a pillow that you can clean in the washer. However, buying covers is also a good option. This way, you will only wash the covers. It is a lot easier and a lot simpler. Plus, you will not need to wait for your pillow to dry to use it again. Also, keep in mind that most memory foam pillows get ruined in the washer. This is an essential feature you should look for in a sleeping pillow or any other pillow because if you don’t, and you buy a bad pillow, it might develop bacteria and allergies. This happens because if the pillow isn’t with hypoallergenic and antimicrobial microfiber fill, you will breathe in dust mites when sleeping, especially if you sleep on your tummy, with your face in the pillow. Always pick the pillow specifically made to resist bacteria. Another feature you should pay close attention to when buying this type of pillow or any other pillow is the ventilation system. If you prefer to sleep on your tummy, you need a pillow that is breathable. Avoid pillows that will possibly suffocate you while sleeping. Buy pillows with a ventilation system, instead of buying the fluffy ones. How much should I spend on positioning pillows? This is not a question that we should answer, considering the fact that we do not own information about your income. However, it is always better to invest in a quality pillow once, rather than buying a cheaper one and stressing over it because it is not comfy. 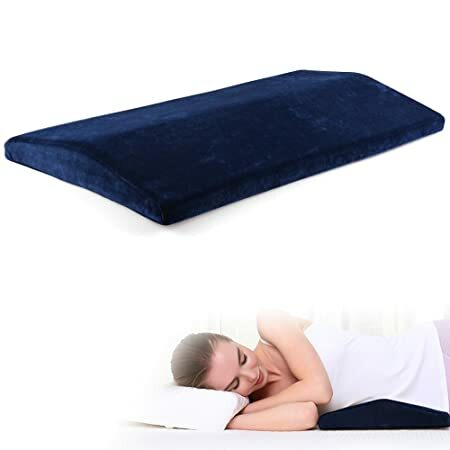 If you want to improve your sleep and reduce some type of pain you are dealing with, we suggest you buy a good positioning pillow, according to your needs from the table above. Amazon has the simplest system you can use to compare prices and select the one that you can afford. However, keep in mind that the better the pillow, the better your sleep. We hope you find our guide on best sleeping pillows for elderly 2019 helpful. We have done research and compared the best pillows and shared their pros and cons. Do not hesitate to ask your questions in the comment section and follow us on social media.